Well, apparently while doing homework on a Sunday night is NOT the time to ask a 14 year-old young man what he is thankful for! I think I offered up more than a few suggestions of things to discuss and the best reply I got was a half-smile with a “maybe.” Gosh – I thought girls could be moody! 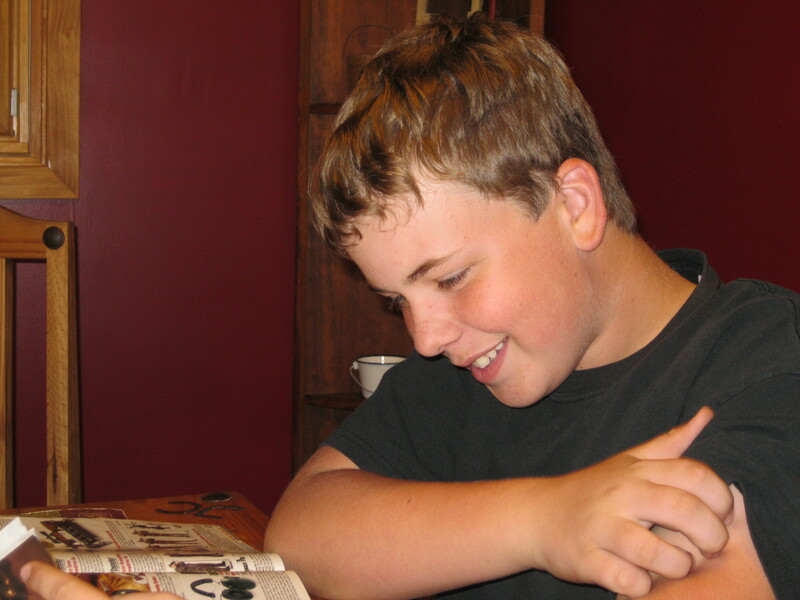 Emmet is checking out the Cabela's catalog so he can give Grandma his Christmas list. Regardless of the homework attitude, I have been listening to Emmet for specific appreciation of things over the past few days. Little does he know, I spotted a number of things he is glad to have – the main one, since I am writing this and get to put words in his mouth – a FANTASTIC Mom!!!! Heehee!!! Ok, he might not be quite so enthusiastic about saying that, but I like to make myself feel good. However, last night when he came in from wrestling practice, the first question was, “What’s for supper?” I was in the midst of making homemade Runza’s & I got a HUGE hug and “thank you” & “I love you” from him! It is true – the way to a teenage boy’s heart is through his stomach! I also happen to know that Emmet really enjoys hunting and shooting. When he was struggling with writing a speech on Saturday, I encouraged him to head outside and either go hunting or do some target practicing. I don’t know how many rounds he shot, but practice he did! I am absolutely certain that he is thankful for the opportunity to live in the country where he can work on his marksmanship skills almost anytime. He is such a guy’s guy! As a mom to Emmet, I am thankful he will come to me or his dad when he has an issue – whatever that issue might me. I have noticed that he tends to favor Matt over me for certain things – mostly because they like to laugh at me when I’m not “in the know.” And, I think that’s great! Laughing together is one of the things that keeps our family close. If we lose the ability to joke with one another, we have lost many of the joys life has to offer. As we approach Thanksgiving, we are all thankful for our food and those who grow it. I am also thankful for so many other things that aren’t tangible things & I hope you are, too. Happy Thanksgiving to everyone ~ I wish you all a blessed holiday! All farmers, I don’t care what they say on a bad day, love, love, love the intensity and pressure and excitement of harvest (which is quickly winding down in our area). And they should! Crop farming is a little bit like planning a wedding with at least a full year-long engagement. Men out there, tune in here… – you may be able to use what I’m about to write to help put your wedding day (or your daughter’s) in a light you can completely relate to. Girls, tuck this little bit of “marrying a farmer” ammunition away in your memory bank for when it is most needed! As I type this, farmers are caring for the soil in their fields. They are either shredding the corn stalks or allowing cows to graze them so there will be less material to try to plant through next spring. Plus, when the stalks get shredded up, they do a better job of working their way into the topsoil and start breaking down as organic matter. Farmers are also contracting crop inputs (seed, fertilizer, weed control) for next year. All of this would be similar to reserving the church and caterer and communicating plans to the wedding party. Some fertilizer can be applied this fall before the snow flies – yep, we just purchased the brides maid’s dresses here, girls. They are lovely and they always cost more than we want them to, but, they are absolutely necessary for the perfect wedding. All through the winter, farmers will be delivering grain to elevators, feed yards, and ethanol plants. This grain may have been sold previously for delivery during a certain month. That would have been part of that earlier mentioned planning. I’m not quite sure how this part compares to wedding planning except, there are a large number of farmers and truck drivers who make the most of sitting in line by doing a lot of visiting. Girls really, really like to talk about their wedding plans. By late winter and early spring, farmers get all of their equipment field-ready and pick up their seed, so the first day they can run, they don’t have anything slowing them down. I’m thinking all of this is similar to hiring the music for the dance and lining up the photographer, not to mention, getting the engagement pictures taken. We cannot have a thing go wrong on the big day! When planting season hits, it’s all out field work time. Distractions are not welcome! This is where flowers, invitations, and gift registries MUST be completed. Through the summer, there is some work of weed control and possibly irrigation, depending on geography. The crops are growing and barring a terrible hail storm, the crop is made. Now is when a bride or groom-to-be can start feeling reality set in and begin to second guess. Have no worries – if everything was thought out well and all communication passed along, the wedding and marriage will be just fine. Finally – fall rolls around and here we are at harvest time – the WEDDING DAY! All of that work, planning, purchasing, waiting, trusting in products and mother-nature – it all comes to fruition and is here and gone before we know it. We all say we spend a year planning for 20 minutes when we are talking about our wedding. Harvest certainly lasts more than 20 minutes, but it really is the enjoyable, rewarding part of farming. I remember as a kid LOVING when my mom and dad would have meetings! That meant two things, a fun babysitter and pizza. I was pretty sure, on those nights, life could not get better. I was not old enough then to understand the impact my parents were having on our community and agriculture – I was WAY too busy talking the babysitter into playing every game I wanted to play(I hated losing out to my brothers & sister on game choices)! 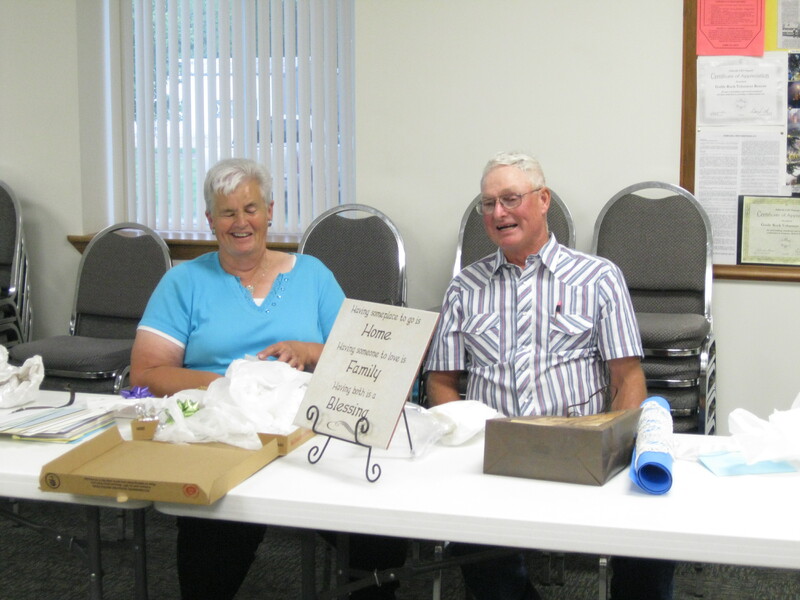 Mom was always involved in an Extension Club, church groups, town celebration committees, School Board and she was REALLY involved with 4-H. Dad volunteered his time for Extension Board, Natural Resource District Board, Coop Board, and Rural Fire Board. (I’m sure I missed an activity or two in there, but you get the idea – they are committed to the community and agriculture.) When I look back, I realize they were involved with everything from state policy to deciding the best options for our small school district to making sure there were opportunities for young people to learn and have fun. I think the most honorable thing in regard to all of that is that they never put anything else ahead of God and family. They made countless sacrifices for us kids and they have helped each of their parents age gracefully through the years and live out their lives on their farms. All of this was done with farming as the sole source of income and some years were pretty lean! When I look at all they do and have done, I realize that I come by my level of volunteerism quite honestly. It’s in my genes! Mom and Dad have been a stellar example of choosing what to be involved with at specific times and being totally committed when they are involved. It’s pretty simple – do what you say you are going to do and do it to the best of your ability. Both Mom and Dad’s dashes are chock full! Neighbors the age of me and my siblings look to my folks for guidance and advice. My parents’ house is often the weekend breakfast stop for whoever might be driving by and they are always the ones looked to by neighbors and community members for a sound, objective opinion on a sensitive issue. I hope my dash is half as respectfully full as theirs when I reach their ages. A couple of weeks ago I attended the funeral of a man who taught me a great deal about feeding cattle and raising a family, and most importantly, living life. During my years of working in feed sales and beef nutrition, I loved all of my customers for their uniqueness and their love for livestock and farming. I have spent many days in sale barns learning from folks like that man this article is about. Definitely days well spent! I was very sad to see the end of this person’s life on earth, but I am truly thankful for all of those visits standing over the feed yard fence and sitting at his kitchen table and sitting in the seats at sale barns. The priest at my friend’s funeral had a wonderful message & I couldn’t help but jot a few notes for a future blog topic. So here I am – writing about the dash. As the saying goes, there are two things we are guaranteed in this life: taxes and not making it off this earth alive. While that is certainly true, it is a bit of a morbid thought. I prefer to focus on something else, something more cheerful! The priest at the funeral pointed out – on our headstone, there are two years printed; the year we are born and the year we die. The most important parts of our life are not those two dates, but the dash between them. How we fill that dash is up to us. The gentleman’s life that was being celebrated had a very full dash! He and his wife raised 9 children to all be very successful people, ranging from farmers and beef producers to teachers to business people. With that many kids, there are bound to be several different occupations in the final mix! Family has always been at the core of their farm, just as with my family. I loved hearing tales of weather and pricing challenges that happened through all of his years of raising and feeding cattle. I was amazed at how he could remember an animal or pen of animals from decades before and compare them to what we were looking at right at the time. He was extremely involved in his church and made it to many, many of his grandkids activities, including college athletics. 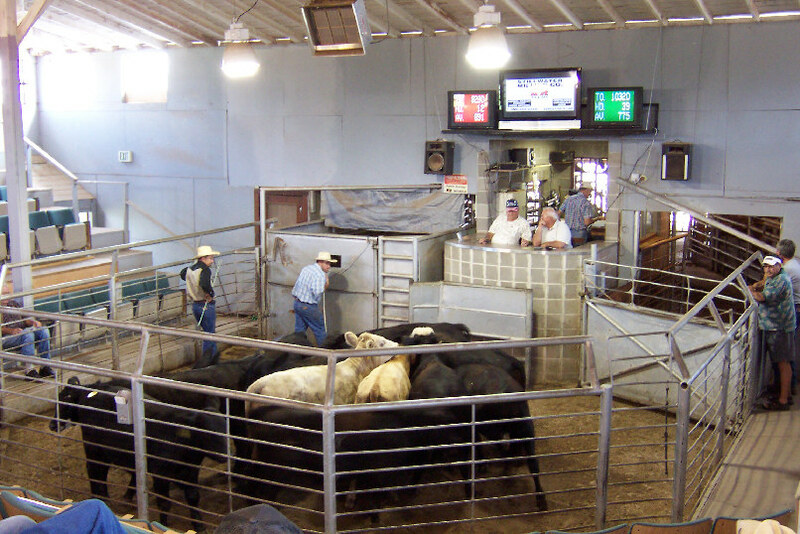 Besides all of that, he would make his rounds to several sale barns each week to buy cattle and he was involved in cattle and grain organizations. I’m sure he never woke up in the morning and had to look for something to do! I share this because it is just one more example of a great farmer who was also a great person. Too often, farmers get accused of making decisions based solely upon potential financial gain. I will say, it takes a significant amount of land and cattle to generate enough income to raise 9 kids and send them all to college. But more importantly, his farm and livestock were handled, over the years, in such a way that the next generation is assured the opportunity for a livelihood and can continue the family legacy of farming. Sustainability is such a buzz word these days – many families, just like this one, continue to demonstrate absolute sustainability environmentally, economically, physically, and emotionally. This man’s dash was full of caring for God, his family, the land, and his cattle & I am so glad I got to know him!